On a beautiful day: I travelled to Long Island City, Hunters Point to be exact, to Chef Ian Kapitan’s new spot Alobar. I was reluctant that such grande cuisine would exist in Long Island City-I was wrong! Alobar, a beautiful restaurant, with large open seating windows, stressed wood ceilings, a long marble bar that evokes a bright airy dining room space. Alobar was started by Jeff Blath (Jane) and Lisa Kalick (a physcian). In the kitchen, Chef Ian Kapitan’s menu boasts the gammit of all elevated comfort meat and seafood dishes, especially PORK! You’ll find a decadent charcuterie plate with piles of sweet norcino salami, Virginia prosciutto, boar & hazelnut patè, theres a Duck Confit “sloppy joe” with smoked ricotta, truffle, red wine onions, topped with sunny side up duck egg and mixed greens.You may want to try the Mac & Cheese “Carbonara” with four cheese blend, pancetta, truffle braised egg? All these items are reason to go to Alobar-but my quest here was the burger! Coined the Hunters Point Burger, Chef Ian concocts a behemoth like stack-of typical burger toppings- except done exceptionally! there’s a moist patty, blanketed with warm creamy melted cheddar, smoked balsamic onions, spicy pickles and beer battered bacon-Yes! beer battered bacon. It that wasn’t enough to satisfy your flavor addiction, it comes with a heaping bowl of-skin on- truffle fries. The burger arrived and already I was excited over the crispy slabs of beer battered fried bacon that my mouth wasn’t going to wait long to dig in. The crunch of that beer battered porky goodness resting upon a juicy plump patty was need I say-the sexiest thing I’ve tasted in a long while. The robust sweetness of the onions and the creamy silkiness of a high quality cheddar was welcoming and extremely good. Alobar is a snout to tail, meaty poolooza of a restaurant with a comfort sensibility to the palate . Everything here is good, it’s so good-it’s almost bad! You’ll enjoy every guilt ridden bite into flavor town. Well done Alobar! Check out the DMANBURGER’S best burger in New York, the quest has been long and still ongoing…but the FOOD Magazine’s crew and writer Jo Piazza caught up with me to snag some inside scoop on my life, history, love for burgers and of course the best burger in New York……and the winner is ? Grab a copy of the latest FOOD Magazine ( with Rocco Dispirito on the cover, and featuring Emeril, Micheal Chiarello, Iron Chef Cat Cora and Alton Brown plus more…. on newstands NOW !! Newly opened Blackburn Burger Bistro is situated in busy Hell’s Kitchen- open bay windows with faux-plant hedges will lead you into a decor like you were stepping into a Holiday Inn Express banquet room-red and beige walls, oversized floral patterned banquettes and a gaudy stain glass chandelier. The dining room is small with minimal wait staff with minimal knowledge of the product they are serving. The menu is moderately inventive featuring starters like grilled corn on the cob, and a Crab and Shrimp melt and various soups and salads. Happy couples, mostly tourists, sipping beer in tall warm glasses and wrestling with chewy Tandorri chicken with cous cous and leaves of lettuce. The grilled shrimp salad with bacon, avocado and citrus dressing, was simple and fresh. The burger headliner is the Blackburn signature -a classic beef pork blend with sautéed onions, a dollop of pimento mayo and a puffy lightly toasted bun. The Blackburn signature was charred black on an open flame grill, criss crossed crunchy edges and a medium well-cooked center. I was never asked how I would like it cooked and really never thought at the time to tell them. The patty was a little dry, but still with the crunchy pieces of charred burger, gave ample flavor and texture. Rich smokey sautéed onions were piled high on top and the pimento mayo added a nice smooth peppery flavor. The bun was surprisingly light and fluffy. The Vietnamese burger consisted of lean ground pork served with ham, cheese, daikon, carrot, cilantro and zesty chili garlic sauce served on the same puffy roll. The Vietnamese burger was the better of the two, a garden fresh porky flavor, with a crunch of the vegetables and the zing of the Asian chili sauce complementing it nicely. French Fries were partly skin left and sadly soggy, they also have a slider, a chicken burger with basil mayonnaise, and seafood burger with guacamole on a baguette. Blackburn’s staff were friendly if untrained and unsure, this hopefully for their sake will improve. As far as hamburgers go, few have reached such fame as the “Jucy Lucy”.The creation comes from either Matt’s Bar or nearby 5-8 Club in Minneapolis MN. The misspelling of the name coins its mystery and renowned reputation. As the Wikipedia page explains “ Matt’s Bar boasts on posters that if it’s spelled correctly, you’re at the wrong place”, while in contrast “Employees at the 5-8 Club wear shirts that boast the legend ” If it’s spelled right, it’s done right.” Despite the combativeness, no one is denying the idea that stuffing a patty with a luscious type of cheese is a genius one. New York native, Craig Koenig and a few of his buddies recently opened Whitman’s Restaurant in the East Village, which opted for the correct spelling of his version as printed on the menu [Juicy Lucy]. A simple shop front marked “Slow Food*Beer*Wine*Cafe” opens into a small space with muddled decor. Accented with an Americana theme, Whitman’s is fitted with simple barnyard walled sidings and minimal country seating and white subway tiles with a wall-lined bench. Service is counter style where two styles of burgers are available-the Upstate Burger-an all grass fed creation with seared onions and ultra-secret special sauce and the famous “Juicy Lucy”. A Mama’s Boy free range chicken sandwich with Coffee BBQ sauce and Fennel-jalapeno slaw [$9] and a Succotash Maide-Rite [$9] made with cumin roasted carrots; corn, edamame and poblano cilantro with cilantro, round out the menu. Fried accoutrements consist of hand cut French fries and Crack Kale-a flash fried kale dusted with red pepper. As the Juicy Lucy arrived to my table the server warns me, “Watch out for your shirt- it can get messy.” Towered on a speckled sesame seed Blue Ribbon Bun with a vibrant green leaf of Bibb, caramelized onions, chunks of red tomato, spicy pickles and coated with mayo. The girth of the short rib blend was plump and glistening with color. A rush of pimento cheese flows into the mouth of the eater, bursting out of the patty with aggressive force, combined with a seasoned zest that represents Creole flavors. When asked what that was, Koenig stays tight lipped. The French fries were crispy, salty and plentiful, coupled with a wad of Crack Kale made for a wonderful gluttonous experience. Keeping in with Koenig’s idea of provided affordable fare to the neighborhood, he also features a small selection of quality Ales quench your beef soaked palate, Six point Rye and Blue point Summer Ale are available in frosted Mugs for $4-bottled beers for $7. With a the price tag of $8, the Juicy Lucy bursts in to the Gotham burger scene with succulence and originality. A buff ,but cordial doorman ,stands shifting his weight from side to side, while a pretty reservationist with almond shaped eyes shares the aroma of charred beef and uncorked Bordeaux with awaiting patrons. These are images and sensations of Minetta Tavern. This personified “classic steakhouse meets neighborhood” tavern by restaurateur virtuoso, Keith McNally, plays for a raucous sophisticated audience and its routine is flawless. Knowledgeable servers dressed penguin-like circulate hurriedly around the black and white checkered floors, a steadfast all-knowing manager, and a cheeky, yet comedic bartender-completes this cast of Minetta players. Like the set of a 40’s film, the stage is a grand ole tavern with faded frescos of a New York now past. Finishing’s of deep brooding oak enhance McNally’s trademark leather banquettes that are romantically positioned beneath littered charactertures of anonymous old neighborhood guys that reflect some of these past iconic patrons-nestled tightly around the room- each booth telling a story. Minetta Tavern was once a haunt for New York poets, writers and educators-opening in 1937 and named for the Minetta Brook which ran southwest from 23rd Street to the Hudson River. Offering an exclusive patronage to the rich and famous is often coupled with a somewhat reclusive attitude when making a reservation, especially when only a private number allows one to do so. I, however, did not experience anything, but prime treatment. Perhaps I was lucky or mistaken for someone very rich and famous. The diner then sparingly spreads onto crusty baguette points and can then be dunked into a shallot confit. The conversation at our table was muffled and interrupted by groans of happiness and content. Other omnivores that were sitting in the vicinity were gorging on other “Grillades” menu items, like the Bone-In New York Strip [$45], Lamb Saddle “Tranche” [$28],Veal “Porterhouse” Chop $36 and the bountiful Dry Aged Côte de Boeuf [$104 ] for two, with roasted marrow bones and sucrine lettuce salad. Typical pommes favorites [Frites and Anna] and a Legumes selection rounded the menu. Although all of these fore mentioned menu selections are stars in their own right, the crowd pleaser of Minetta, of late has been the Black Label Burger. The clandestine blend, exclusively created by La Frieda for McNally, has been talked about, admired, and unsuccessfully duplicated since its inception. A secret blend of highly selected aged beef cuts is molded into a patty and gently placed on a piping hot flat grill and generously mopped with clarified butter until pinkish red inside. The succulent plump patty is then perched on a soft toasted brioche.-All sounds simple enough because it is just that. The complexity of flavor equals a brilliance and superiority against any other counterpart. 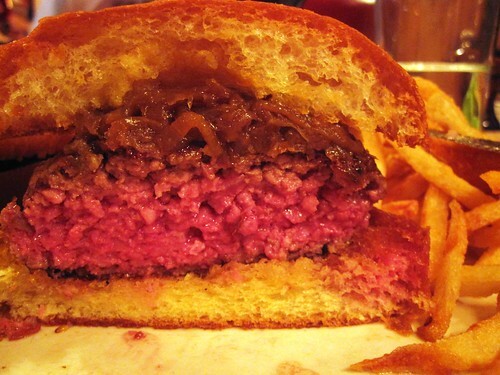 At $26 the Minetta Burger may not be eaten on the regular, but should be tried at least once. Furthermore, the quest for the best burger in NYC is now in danger of being completed and sealed. Only time will tell. Keeping up with the ongoing burger craze in New York, Tall Grass burger shone its light on the burger addled scene recently in the East Village. Owner Kevin Huynh is no stranger to the restaurant business, having run several Quantum Leap outlets in the city. Yes… That’s right! I said Quantum Leap–the city’s well-known den of vegetarian fodder. Huynh traitorously switched to the dark side of the trade, by slinging out various carnivore favored sandwiches including 6 grass-fed burgers, a turkey burger and flame-grilled chicken versions. Tall Grass Burger is a modern, clean and simple burger shop, complete with friendly staffs that are clearly learning the ropes in the burger world. With counter service and a help-yourself condiment station, Tall Grass serves up colorful names to label their beefy delights. I asked one the staffers, “What should I order? ” After initially a blank face expression, I got the nod to go with the signature Tall Grass, which was generously stacked with crispy onion rings, sliced avocado, cheddar cheese and fiery horseradish mustard. 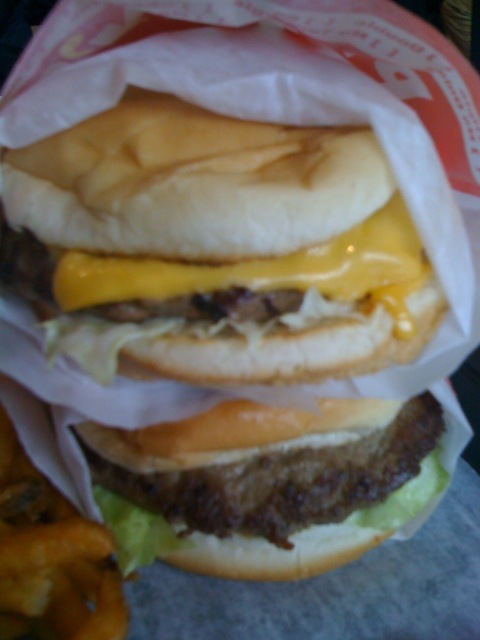 I found out about the Tall Grass Burger from The NYC Food Guy, which he reported on, and he was then featured on Eater . He stated that, “Tall Grass Burger was doing a buy one-get one 50% off deal”. I snatched up the chance to take advantage of this thrifty opportunity, and get burgered East Village style. Tall Grass has a small dining room with counter tables and perched window seats, where I gazed overlooking the yellow chariots whizzing by on a balmy New York afternoon. I was treated to an array of fried potatoes, which was overzealously forced upon me, by one of Huynh’s staffers. As I waited for my “Classic and Tall Grass” burgers I tasted the fries which were speckled with little crystals of garlic that burst onto the buds with every bite-which unfortunately was over powering. The burgers arrived, and I was impressed with freshness of the pickles, onion, and fronds of lettuce splashed on the paper lined baskets that were the vehicle for my burger tasting. An oozing of horseradish mustard cascaded down the side of the soft bun, which had been griddle pressed to perfection from the top, leaving a toasted char on the roof of the sandwich. The scent of toasted sesame instantly hit the nose, followed by a juicy but season less patty. For the Tall Grass burger, the flavor was accented by excellent horseradish mustard which was the highlight- the burger meat itself lacked depth and finished in my mouth as a nonchalant memory. I’m sure a less than fanatic burger adventurer would find some solace and satisfaction in this deli mimicked nosh, but for me- Tall Grass was a “short order”. Recently I visited the much blogged and written about Stand burger. In its conceptual phase it was expressed by a who’s who of food aficionados that such criminalist burger atrocities had occurred there. A penchant for the dramatic and skeptical, I was interested to see what sparked such auspicious burger educators to voice their dissatisfaction. Interestingly Stand Burger was created by noodle king Jonathan Morr , famous for APT and Republic who then in 2007 started to think burgers. Stand has a modern open feel with some communal bench seating and a spacious dining room, perfect for a large crowd. I sat at the bar which was teaming with youngsters and college types. ESPN was showing on all TV’s and people were drinking like fish for 3.00pm in the afternoon, which made for a raucous bar scene. I found out there was a relatively new burger on the menu, the BOLD Burger, a gigantic twin patty goliath of Pat La Frieda beef stacked on a brioche bun with apple wood smoked bacon, sautéed onions, American and cheddar cheese, pickle, tomato, chipotle sauce and fried egg. The menu has an array of beefy pleasures, burgers for every palette are featured here such as the Stand Burger noted as the “best burger in Manhattan at any price” with onion marmalade; Mushroom Beef Burger, Buffalo Blue Cheeseburger,Veggie Burger with quinoa, mushroom, zucchini and parmesan and the Hamburger with shredded lettuce onion marmalade and green peppercorn sauce. Other favorites on the menu include a Burger Salad, Shrimp Po’Boy, Crabbie Pattie Sandwich, fries and Onion rings-which are blogged about as the best in the city! I went with the Hamburger, BOLD Burger, and the much hyped about Toasted Marshmallow Shake. The Hamburger arrived first; it was plump and piled with shredded lettuce and green peppercorn sauce oozing out the sides. I thought the green peppercorn sauce brought an interesting element to the burger, tasting like steak au poivre more than a burger. In the distance I could see the BOLD Burger coming from the kitchen; it was like a tower of beef and pork levitating across the room. All I could see was this thing of structured beef beauty coming at me, it was daunting but at the same time exciting. I picked it up to take my first bite, struggling to handle its bulkiness. I opened wide, but just grazed the outside of the beast, the taste was succulent and juicy for the first 2 or 3 bites but then fell apart in my hands ending up like a meatloaf on my plate. I finished what I could of the burger, but it lost its juiciness and its flavor and ended up in torn mangled pieces on my plate. The Toasted Marshmallow shake with honey lavender chocolate, peanut butter cap, mint cookies and cream; however was one of the best things I have ever tasted ! It didn’t have any Bourbon in it, but it was a good $7.00 milkshake. In a burger addled town I found Stand to be disappointing, however the overall atmosphere and the staff were very friendly and invitingly appealing. Hidden in the outdoor pavilion of One Worldwide Plaza between 49th and 50th Streets in the Theater District of Manhattan, you’ll find Mother Burger. A burger joint with an outdoor beer garden/college campus type feel, Mother Burger also slings out, kobe dogs, grilled cheese,wings and $2.00 brews to urban youngsters, theater tourists and nearby locals. Created by Blockheads Burritos brothers Don and Ken Sofer, Mother Burger specializes in smashed fast-food type burgers reminiscent of a faux-In-Out style burger.I sat outside and gazed around at happy tables enjoying the spring weather, guys were downing jugs of amber and girls were sipping high potent umbrella drinks, I felt like I was on a Carnival Cruise in the Caribbean not a few blocks from Times Square-which could be good or bad depending on how you look at it. Our waiter, who looked like the singer Moby, and was clearly still feeling the effects from “The Adult Flu” sauntered over and inaudiably mumbled the specials. His focus was momentarily taken from our attention as he became increasingly worried about the flocks of “air rats” (pigeons) that were wreaking havoc on a nearby table. Reminiscent of that movie The Birds it was one of the more stranger events that have occurred during my burger dining days. Suddenly our whiskey-logged waiter came to the rescue, by banging two large plastic drink trays together. The sound was a loud and annoying clacking sound, that consequently caused the filthy flying rodents to scatter above the skies. Now that the drama was over I pondered on which burger to get, and I decided on the Single Mother with cheese and a double order of fries which are ordered separately. The burger arrived open-faced cradled in a tacky red basket,with a side container of “special sauce” which was undeniably Thousand Island dressing. The burger was relatively moist and decent, the flavor was good, and the fries were crispy. I tasted the freshness of the red-onion,pickles and tomato and the sharpness of the cheddar cheese as I consumed the little mother quicker than a pigeon picks up scraps. Mother burger is cheap and cheerful and a moderately good burger joint with a colorful and friendly staff, if the weather is pleasurable, so will be the atmosphere. Indoors is more of a dive bar type feel than a restaurant, so stick to the outdoor seating, where you can bask in the sun and drink $2.00 Pabsts and watch the city walk by. The menu has some solid choices but stick to the simple items such as the burgers, kobe dogs and grilled cheese. And watch out for those umbrella drinks, they could leave a mark ! The famous Spotted Pig was the scene for my most recent burger gorge, the otherwise known Gastropub with famed pork servant April Bloomfield at the helm was a long-awaited treasure. I finally worked up the courage and patience to face the long sometimes 2 hour waits that were promised, only to be pleasantly surprised and whisked upstairs by a more than capable “piglet” for a spot at the bar. I look around at the room and was in bewilderment by the amount of people devouring the juicy signature burger! “Could it be that good”? “Could it be that popular”? The answer to that will be revealed, for now I was taking in the sights of the trend setting fashionista’s and urban pop foodies dining and chatting in a decor that resembles someone’s Grandmothers house rather than a critically acclaimed eatery. With old-fashioned trinkets, pig ornaments and flea market type memorabilia, it made for a visually entertaining rest while I waited for my famous beef party on a bun. The Michelin star winning “Pig”-as Ms. Bloomfield calls it-came about in 2004 after partnering with other culinary giants Ken Friedman and Mario Batali-whom she is also in cohorts together with many other restaurants, such as John Dory and newly famed Breslin. The much written about burger that I was about to sample, was everywhere on diners plates, seemingly calling me from every angle of the room with its perfectly grilled bun creamy Roquefort and tangles of rosemary strip fries. I grew impatient as I smelt the aroma’s of rosemary and beautifully pungent cheese waft through the air as yet another burger was served to a nearby customer. ” When was it my turn”? I thought to myself. After some witty jovial conversation with the bartender, my wait was over….this glorious beast of a burger was placed down on the bar in front of me, it’s pure beauty captivated me for a second as I decided which way I was going to bite into it, with condiment or without ? I opted for it as is, and my taste buds were swamped with an overwhelming flavor combination of superior beef quality and excellence in creamy Roquefort. My knowledgeable cheese source (MB) informed me that the much sought after Roquefort cheese featured on the Spotted Pig burger was in very near danger of being ousted by the triple increased tariff placed on luxury goods. Thankfully the Gods saved us all from such a travesty and future happy burger eaters can continue to savor this delightful creation as nature and Ms. Bloomfield intended. I enjoyed every last morsel of my burger as I occasionally paused not wanting it to end, the strands of rosemary fried potatoes were insanely good and crispy. I found myself shoveling these fries into my mouth as onlookers watched in amazement. I could have eaten everyone else’s plate in the place! I was like some hunger crazed animal let loose in a cage of harmless and defenseless prey, gorging till there was no tomorrow. But sadly after a few minutes, my Spotted Pig experience was but a memory. In case you haven’t realized by this story, this portion of my quest at the Spotted Pig was pretty much perfect! The staff was pleasant and professional, the atmosphere was fun and lively and most of all the burger was in a word “AMAZING”. At $17 it’s on the high-priced side for a burger, but personally I thought it was worth every penny. On 59th and Lexington Avenue in Manhattan you’ll find Bloomingdale’s, the iconic department store famous for such historic events as the invention of the hoop skirt, the modern shopping bag and one of the stops on the Queen of England’s 1976 New York shopping spree. Flip burger shares the menswear floor with such labels as Helmut Lang, Viktor Rolf and Hugo Boss. It caters to high-end Euro-shoppers and opulent Upper East Side families hoping to keep their ankle biters at bay, while they take a break from browsing the latest fashions. The decor is sparse and light with minimalistic fittings, subtle backlighting, that tightly seats about 70 hungry shoppers. The menu offers signatures burgers, salads and also a create your own burger section where one can mix and match their burger fixings choosing from several burger building materials, such as a unique variety of buns, side sauces and other accoutrements. My server Jodie was a smart and knowledgeable, flitting about the room offering stumped and indecisive customers; such as me, help in selecting the greatest burger combination. She suggested the wasabi and ginger brioche bun with my choice of the hearty /short rib blend, coupled with the rich smoky homemade BBQ sauce and velvety blue cheese. As an extra treat I sampled another burger with the sweet/brisket blend, sweet pickle relish and rich gooey Jack cheese .Unfortunately my choice of BBQ sauce was quite overpowering to a delicate and beautiful La Frieda blend of patty, the meat flavor was superior and was melt in the mouth good with every bite. The soft yet toastiness of the bun was the last foundation to an exquisite burger creation. The sweet/brisket blend was refreshing, bursting out with flavor by the “tangy sweet pickle relish” that was so good that it would make a Southern Grandma jealous. The Jack cheese was divine and was perfectly slathered on the patty and paired with a plain perfectly toasted brioche bun. The French fries were shoestring thin and crispy, served with a plentiful measure in a cone of paper, but they were mundane to taste, lacking in flavor and seasoning. Unfortunately Flip burger is not cheap, with French fries at $5.00; create your own burgers staring at $12 and signature burgers from $16 to $23 for the Wagyu Benedict burger. Flip burger was an adequate in-department store eatery and worth a visit while, after meandering around Bloomingdale’s on a busy Saturday shopping, I would recommend that you keep it simple, and try not to get too adventurous with the multi-condiment menu, the beef blend is well worth trying with minimal condiments. If you are not sure ask your server I found them quite helpful and knowledgeable with the exact flavor match that will comfort your carnivorous palette. Flip is solely owned by the Bloomingdale’s Corporation and is the guinea pig restaurant for them, to judge whether they will appear in other stores. Honestly if I wasn’t shopping at Bloomingdale’s I probably wouldn’t eat there again, not because it wasn’t good, but because I find eating in a department store kind of depressing, it brings me back to my childhood waiting around for hours at some basement department store eatery while my mother shops the unmentionables counter and my father screams frustrated about where my mother is and………..well, you get the picture!